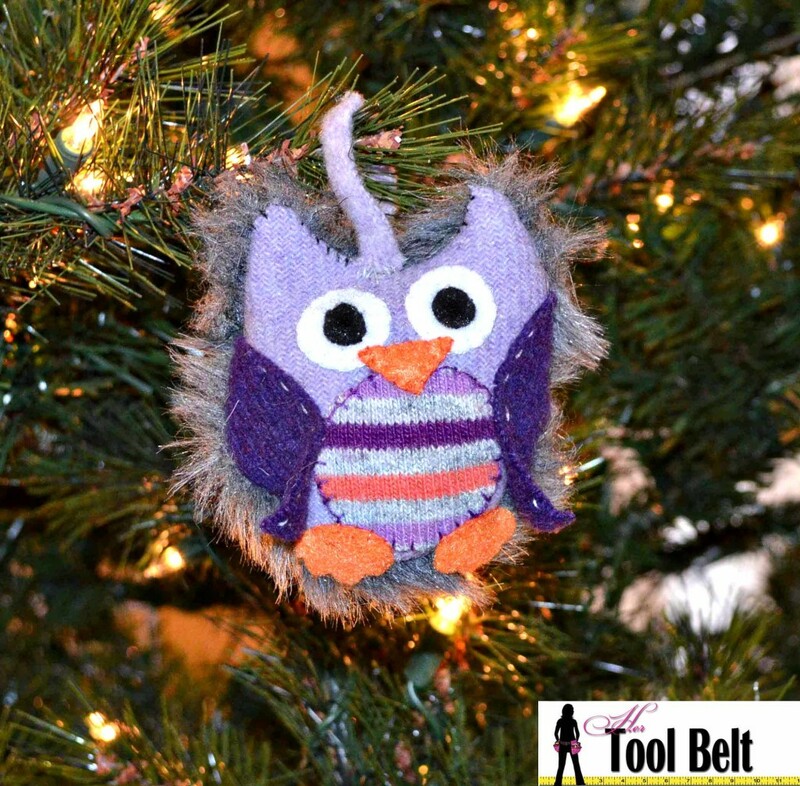 On the second day of Christmas hertoolbelt sent to you, a sweater owl and a mini-mitten on a wooden tree. I love making cute little owls. I help out my friends at Capo and Stubs with the hand stitching on their cool owl earmuffs. 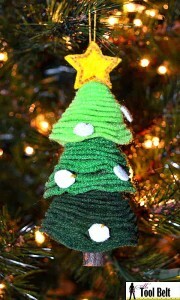 This owl ornament is made from old recycled sweaters and felt. The back is scrap fur I had. If you don’t have these items, the owls are still so cute made from felt, and/or regular material. Start by appliqueing the black eyes onto the center of the white eyes. Next blanket stitch the tummy onto the body of the owl. Begin at the top of the wing and stitch the wings onto the body using a running stitch. Stop stitching the wing to the body where the black dots are on the assembled owl diagram. Continue the running stitch for looks only through the wing material, stitch around to the next dot and begin to stitch the wing to the body again. Repeat for second wing. Applique the eyes to the owl body, then applique the beak. Next take both body pieces, match together with the good sides facing each other. Fold your 1/4″ material in half, placing the loop in between body pieces so the ends of your strip are slightly visible at the top of the owl head. Stitch around the body leaving at 1 1/2″ – 2″ section open at the bottom of the owl body. Flip the body right side out. Stuff the owl as much as you like with poly-fil or whatever stuffing you have on hand. Fold the edges of the gap in and stitch the gap closed. Applique the top half of the 2 orange feet into place on the owl. And you are done. Enjoy your super cute handmade Christmas owl ornament.